If you think art and robotics have nothing in common, think again. Artificial intelligence is a tool for creative minds, and increasingly their competition. The digital revolution also provides art with plenty of fodder for critical reflection. An algorithm on trial for murder: In her performance piece and subsequent film, The Trial of Superdebthunterbot, London artist Helen Knowles explores whether a computer code programmed to make autonomous decisions can be held culpable for any fatal errors it makes – here the death of two students killed in medical experiments. Knowles’ piece is part of the Open Codes exhibition at the Centre for Art and Media Karlsruhe (ZKM). The show explores life in the digital world and the relationship between code and art and is on display until August 2018. Algorithms are making inroads into all areas of our lives. They calculate who is creditworthy, automate war, provide early diagnoses for disease or – like IBM’s Watson software – independently edit horror film trailers. And they are stirring up the world of art, as artificial intelligence (AI) cis changing creative perspectives and processes, and even transforming robots and software into artists. In a process known as deep learning, AI software can come to recognize patterns and, similar to the human brain, learn from experience to increase its ability to make automated decisions. The Google Brain “Google Magenta” research project in an experiment in artificially generated creativity. The Brain team is working on algorithms that produce music, video material, and visual art. Applications are published on the “TensorFlow” open-source platform to allow other artists and creative minds to drive development forward. One program, “Performance RNN”, composes music, and while Google Magenta admits that, “the performances generated by the model lack the overall coherence that one might expect from a piano composition”, the artificially generated characteristics and phrasings are still “impressive”. Developers like British Professor of Computational Creativity Simon Colton have spent years building creative software. On its website, his invention, a robotic artist known as the “Painting Fool”, expresses its hope “to be taken seriously – one day – as a creative artist in my own right”. The software paints abstract pieces, which have gotten so good it is hard to tell human from machine. Colton also gave his “Painting Fool” the ability to recognize emotions, which allows it to use colour to reflect the subject’s mood in a portrait, for example. discovering new things,” Quayola says, adding that while the software replaces him, it does not replace the artist, and merely changes the artist’s role. He views algorithms as “musical instruments” for him to play with. olo endeavour. Artists often work with developers, and software and robots can also be valuable team members. 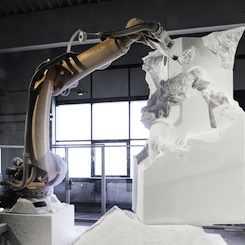 In Quayola’s Sculpture Factory series, industrial robots create sculptures inspired by Michelangelo in real time in the art gallery. So generating art becomes part of the installation itself. Many young conceptual artists highlight and problematize increasing automation, big data and artificial intelligence in their work, exploring digitalization through socially critical art. One art project provided a bot with 100 dollars in Bitcoin to fund a weekly shopping tour on Darknet market places like Agora and Alpha Bay. Some of the bot’s randomly selected purchases included a Coca Cola machine hacking tutorial, ecstasy tablets, and fake trainers, all of which were sent directly to a Swiss art gallery. The !Mediengruppe Bitnik from Zurich and London programmed the Random Darknet Shopper which, like Helen Knowles’ fictive trial that hints at the algorithmic abyss, explores questions such as who is responsible when software breaks the law. We live in a world of codes. The “Open Codes. Living in digital worlds” exhibition at the Centre for Art and Media Karlsruhe (ZKM) reflects on and analyses this world of bits and bytes. Right at the start, visitors undergo their own digital transformation in Bernd Lintermann's interactive installation, “YOU:R:CODE”: starting with their mirror image, visitors are transformed bit by bit into a digital data body until they are ultimately represented entirely as code. Shawn Maximo’s “Open Doors” digital print takes a look at today's working culture, especially in the young programmer and start-up scene, where the ideals of creativity and flexibility in the workplace clash with tremendous time and performance pressure. Who is to blame when software results in a person’s death? Helen Knowle's video installation, “The Trial of Superdebthunterbot”, depicts a fictitious trial of an algorithm for murder. Data mining is the keyword - everything we do online is recorded and evaluated today. Is it also possible to filter out patterns from body movements and use them as data? Through dance, Julien Prévieux's film, “Patterns of Life”, explores various attempts to quantify body movements. A chandelier that sends flashing Morse code signal is a real possiblity today with the right programming. The Murano glass chandelier by Cerith Wyn Evans transmits the “Stages of Photographic Development” chapter from Siegfried Marx's “Astrophotography” (1987) via Morse code. The People's Republic of China has recently become the world's largest producer of bitcoin through its mining activities. For the mixed-media installation “Chinese Coin (Red Blood)”, artist duo UBERMORGEN. COM visited a Chinese Bitcoin mining factory to film what takes place there. How do you trap a self-driving car? Quite simply, as it turns out: Two concentric circles painted on the road are enough, as the picture “Autonomous Trap 001” shows, since the car’s programming will not allow it to cross solid lines. Artist James Bridle has also invented a self-driving car, and he shares the open-source software with others. The !Mediengruppe Bitnik also made art out of the fake profiles found among the data of millions Ashley Madison extramarital affair website users, released by hackers at the end of 2015. Since many more men registered on the website than women, Ashley Madison had created fake profiles, then programmed female chatbots to converse and flirt with users. The media group artists transformed this data and digital misuse into art, recreating these fembots in the Is anyone home lol exhibit in Berlin in summer 2017. They appear as masked avatars on LCD screens hung at adult eye height, from where they continue their chatroom conversations with visitors to the exhibition. Aside from the digital dystopias, algorithms can be quite cute and cuddly too. Los Angeles artist Channing Hansen uses software to calculate the material, texture and colours that goes into his woollen works. The information generated results in psychedelic, knitted wall hangings that are comfortingly analogue. Copyright: Text: Goethe-Institut, Sonja Peteranderl. This work is licensed under a Creative Commons Attribution – Share Alike 3.0 Germany license.